The Department of Pharmacology is the regional Pharmacovigilance centre under Pharmacovigilance Programme of India (PvPI) and is actively involved in collecting adverse drug events/reactions from various departments of the hospital. The information collected is uploaded at WHO-UMC software-Vigiflow to be received at IPC, Ghaziabad which is the National Coordinating centre under this Programme and gathered in national database and from there it is ultimately sent to WHO-UMC, Sweden. This process helps in making regulatory decisions regarding drugs like drug withdrawal /ban from marketing /adding black box warnings to the labels etc., thereby ensuring safe use of the drugs. 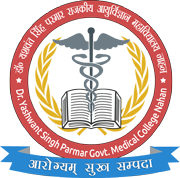 It is mandatory for every medical college in India to have a Pharmacovigilance committee, as per regulations of Medical Council of India, 2010. Therefore, the Pharmacovigilance committee of Dr DYSPGMC, Nahan has been appointed. The broad goal of the committee will be to generate awareness about the need of identifying and reporting of Adverse Drug Reactions (ADR), amongst all sections of health care providers (doctors, consultants, nurses, pharmacists, undergraduate students, service providers etc) of Dr DYSPGMC and to pick up and identify ADR occurring in patients admitted the institute and report the same to the appropriate authorities. To generate awareness about ADRs among health care providers and students of the institute, by different activities. To pick up ADRs occurring in the patients admitted Institute and report the same to appropriate authorities. To undertake scientific and research activities pertaining to ADRs. To make efforts to minimize the chances of ADR and thereby make drug therapy safer and rational. To take up activities to strengthen the ongoing National Pharmacovigilance programme. The committee shall meet once in 2-3 months. The committee shall be responsible for planning, implementing and monitoring of various activities of the Pharmacovigilance committee. They will also work as mentors and facilitators. The chairman will chair and conduct all meetings and will function as administrative head of the committee. Prepare agenda of the meetings and send in advance to members. Arrange for the meetings, write minutes, circulate and document the same. Organize the awareness generation programmes. Coordinate the ADR collection and reporting to the appropriate authorities. Carry out any other task assigned by the committee. Members will primarily work as subject experts and will also do the mentoring of young faculty / resident doctors / students in the area of ADR. They will give suggestions for better and effective functioning of the committee and shall work as facilitators. A description of the responsibilities and interactions of pharmacists, physicians, nurses and other health professionals in the ADR program. Use of the ADR program for educational purposes. Development, maintenance, and evaluation of ADR records within the organization. The organizational dissemination and use of information obtained through the ADR program. Reporting of serious ADRs to Committee. Publication and presentation of important ADRs to the committee. Under Indian Pharmacopoeia Commission (IPC). Ministry of Health and Family Welfare.Govt. of India.